In Wonderful World News today; An online fundraiser has collected almost $116,000 for a man named Wendall Gill. Why, you may ask? 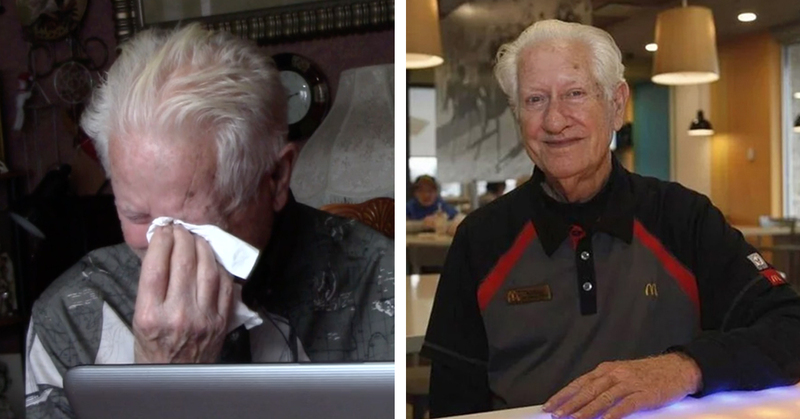 Well, Wendall Gill is an 85-year-old man who was left being the sole carer for his two adopted grandsons, who have special needs, after his wife died inside the McDonald’s he’s worked at for the past 40 years. Two months ago, Wendall and his wife, Della dropped into the restaurant for a spot of lunch while running errands. Della took herself to the bathroom and sadly never came out, after dying of an aneurysm. Wendall has been cleaning bathrooms and taking out the trash of this particular McDonalds restaurant for more than four decades (four decades!). This is where he first met a former colleague and lifelong friend, Tom Oldfield. “When he walked up I could tell he was just destroyed, and he said “I lost my wife,” Oldfield said. Wendall had been married to his beautiful wife Della for 68 years. “Della was his swan; his soul. Wendall is devastated; lost; totally empty now. Nothing is left,” continued Oldfield. Tom Oldfield desperately wanted to help his old friend out, and so he set up a GoFundMe page for Wendall, in hope that he could help him support his two grandsons. And thanks to the wonderful people out there on the World Wide Web, in less than a month the fundraiser page collected more than $95,000. As it stands today, the total has reached an amazing $115,125! All this money will go toward paying off Wendall’s vehicles, home and other outstanding debt… how incredible is that!? In the long run, Oldfield hopes that this fundraiser will be eventually enough for Wendall to finally retire. Bless Wendall, his family, Tom Oldfield and all of those incredibly generous people out there who have helped make this truly horrifying situation a little easier for him to manage!